Damaged carpets that are buckling, rippling, or pulling apart is a common occurrence today. Usually the result of a bad install, furniture moving, burns, or pet damage. The good news is the cost to repair carpets is a fraction of the price for new carpets installation. The bad news is some “carpet repair services” are self-taught and will only temporarily make your carpets look good again. 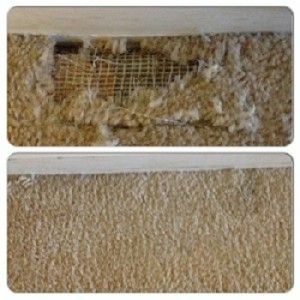 Our carpet repair service goes above insurance company standards. You will save time, money and prevent the hassle of having to deal with an amateur. Being an IICRC certified firm gives us access to the nation’s leading experts in all phases of carpet cleaning. We talk to these experts whenever something unusual comes up. Our carpet technicians have the knowledge, tools, and experience to repair all any most carpet problem. With our experience, education, and resources, we are your experts in carpet cleaning. Carpet Stretching – We use power carpet stretchers, to stretch your carpet back to a tight fit. Trimmed around the edges, and tucked in, your carpet will look like new and be safe to walk on without any more carpet wrinkles. Carpet Patching –.We offer carpet patches in all sizes so you can keep your existing carpet longer and save money. Carpet Color Repairs –Trust our team to dye the area and blend it with the existing carpet. With our help, you won’t have to replace the carpet. Carpet Seems – Seams can start to come undone over time, but we can secure them to keep your rug smooth and hide the seams. Carpet Tears & Berber Snags – If your Berber is running or snagging, let us make the necessary repairs to keep it intact and prolong the life of your carpet. Floods –We can remove the water, dry the carpet and make necessary repairs to save your carpet. Call for our services immediately to salvage your carpet and prevent the growth of mold. If you would like to know more about our carpet repair services, please call 610-292-9069 or complete our online request form.